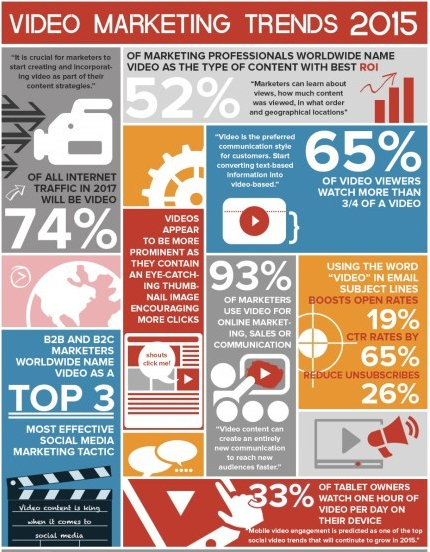 Videos are a great communication tool that convey and transmit large amounts of information in a short period of time. Video files have been extensively used in the marketing field to create brand awareness and build a strong customer base. Including video promotion to the marketing mix can help business to rapidly expand, increase profitability and promote products, services and brand. These days, people would like to make informed decisions, and are hungry for more accurate and fast information. Rather than reading long texts, they prefer to watch a video that spans few minutes and is more effective in communicating the key points to the target audience in a short time. As per Tubular Labs software which tracks 1.5B videos across more than 30 platforms, in one year, 654.7 million videos were uploaded by 66.7 million users and these videos have more than 2.8 trillion views, which is approximately 4390 views per video. This was 2015, and future of video in marketing definitely seems very promising. YouTube gets four billion views each day, Google (which owns YouTube) is the largest search engine, and 70% of the top 100 search listing are video results. Every minute, more than 700 YouTube videos are shared on Twitter, and video sharing has become a big part of social media to get the message out. 400 hours of video are being uploaded on YouTube every day, and in November 2015, Facebook had generated eight billion video views per day. These staggering numbers are an indication that there is an exponential rise in the use of video content in the marketing programs. The marketing videos are placed on the website, or anywhere on the internet and are optimized to rank on the top listings in the search engine result pages. This gets instant exposure and visibility to the millions of potential clients or buyers without spending a fortune. If the video is interesting and catchy, it can gain millions of views within a few days. With the latest software and editing tools, it has become much easier to create and edit informative and innovative content at an affordable price. Including video in the marketing emails increases the open rate, click-through rate and conversions. 1. Budget and Resource Allocation – Every business struggles to strive in the competitive market, that too, with in the limited budget. However, creating a studio and hiring a dedicated video team may not necessarily cost a fortune. If the budget is restricted, start with a dedicated videographer as a resource who can create and edit all the footage and create at least one video each week. Shooting can be done in the real office with the HD-quality camera. 2. Story Description – Keep the focus on target audience and message to be conveyed. An introduction about the company and products is a good start, and then add a marketing angle to it. Graphics and content should be easy to read and eye-catching, and educate audience regarding valuable information about the product, else users will just skip and move on. 3. Content management – It is important to showcase the offerings and products, but ensure to put a human face such as customer success stories, happy employees, satisfied business partners etc. who can talk about positive aspects of the business. 4. Time matters – It may be very challenging to cover up all the business offerings in a short video, however, viewers usually have very short attention span. Initially, it is essential to keep the video marketing content short and crisp. Based on the viewership and demand, go for in-depth longer videos and build a comprehensive library. 5. Video placement – YouTube and Facebook are great platforms, however, YouTube can refer the viewer to unrelated or competitive content. In addition to the free channels, use secure and dedicated hub for videos on the homepage of your website to have better control and keep tab on the viewership. 6. Monitor – The success of marketing videos can be assessed by measuring performance, which includes much more than just the number of views. To know if the videos are working, check the drop-off rates, repeat views and duration of views. Monitor how the videos are being watched, and are they able to engage the viewers. Use these statistics to narrow down the viewers that can be turned into business leads. Create more videos, embrace interactive features and utilize live streaming to have an explosive year. Be creative not only in the video content, but in the entire campaign strategy. It is not necessary to have a huge budget to create interesting and creative videos and include them in your social, content, email and digital marketing campaigns. The staggering numbers of video usage in marketing can’t be ignored, and businesses must explore all the opportunities to tap this resource to increase their profitability and market share. Video advertising should be an integral part of the marketing strategy and budget.